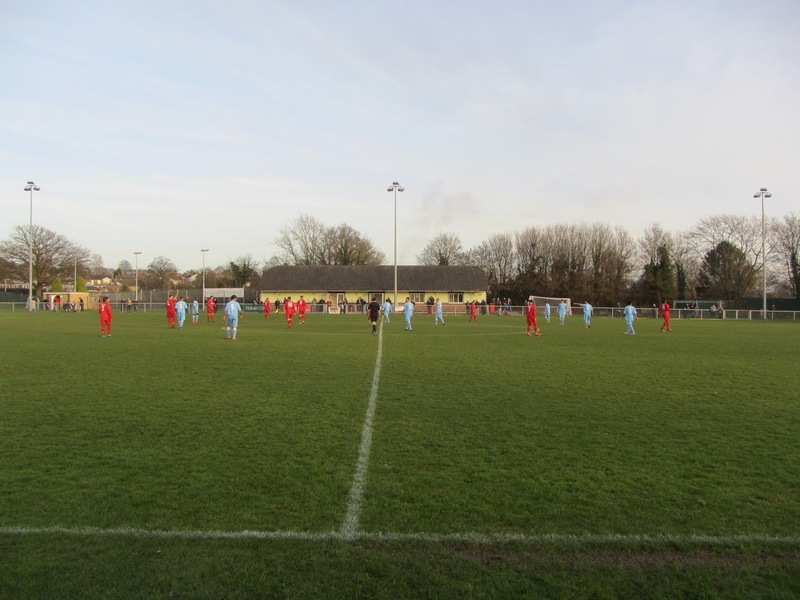 My twenty-sixth ground of 2016 was on Tuesday 27th December at St George's Field in Reigate, Surrey. 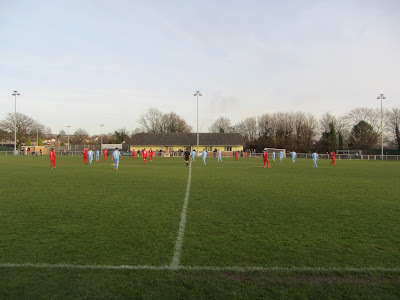 The match was South Park vs. Molesey in the Isthmian League Division One South. St George's Field is part of the South Park area of Reigate on the south-western edge of the town. The ground is part of the South Park Sports Association with a cricket pitch to the north of the football area. The other three sides of the ground are surrounded by fields. Just over a mile and a half south of Reigate railway station, the venue has been home to South Park since 1925. There is an impressive modern-looking clubhouse in the north-east corner of the sports area lying adjacent to the cricket pitch. A walk past the cricket pitch then takes you towards the football ground where there is an astroturf mini-pitch by the entrance. This is on the eastern side of the main football pitch and this side also has the dressing room building level with the half-way line which provides two covered standing areas and a snack outlet. The remainder of the east side is uncovered standing. The western side opposite is uncovered standing though there is a decent sized grass area behind the strip of concrete. 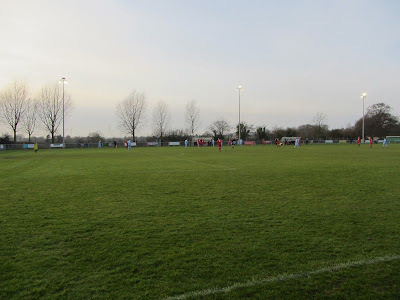 This side also has the two dugouts which are positioned either side of the half-way line. The area behind the northern goal is also uncovered and there is netting positioned directly behind the goal to prevent the balls from going onto the cricket pitch behind. The southern end is mostly uncovered but does have two all-seater stands as well. The larger of the two is a 105 seat structure on eastern side of the goal while the smaller 50 seat structure is on the western side of the goal. Molesey had the best chance of the early going when a long distance swerving effort by Joe Pratley-Lewis almost caught out Calum Thomas in the South Park goal. South Park started to get on top as the half progressed though and in the 36th minute took the lead when Kieran Lavery picked up the ball down the left wing, cut into the box, used a couple of stepovers to make space for himself and drilled the ball into the corner from 6 yards. Molesey's first half ended badly when one of their players was sent off for dissent while leaving the field after the referee had blown to end the half. Less than 60 seconds into the second period things got worse for the visitors as they went two goals down. This one was scored by Jack Stafford who played a smart one-two with a teammate before curling the ball into the roof of the net from 20 yards. In the 63rd minute South Park hit the crossbar but the respite for Molesey was short-lived as Dylan Merchant headed in the resulting corner. In the 69th minute the away side managed to grab a goal after being awarded a penalty for Josh Andrew being tripped on the edge of the box. Joe Nwoko smashed the penalty down the middle into the roof of net. With ten minutes to go Asa Rixon-Nicholls bundled in a corner to restore South Park's three-goal lead but Molesey kept going and a few minutes later Joe Nwoko grabbed his second when a cross from the right found him 12 yards out and he steered home. With the visitors back within two again they pushed forward but were then undone twice in two minutes. In the 89th minute Molesey gave the ball away allowing Chris Smith a clear run at goal. He was able to lift over the advancing keeper to notch up South Park's 5th. Straight from the kick-off the home side got the ball again, ran into the box and though the initial shot was saved Smith was at the back post to score again to finish off a frenetic final ten minutes to the game.